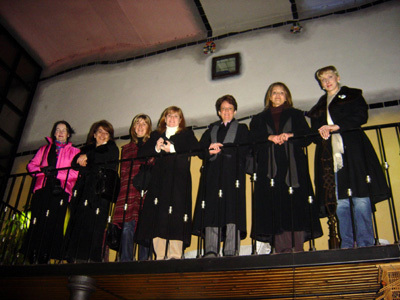 As distance education students living in all parts of the world, we do not get a chance to meet with one another and discuss design as traditional design school students do. 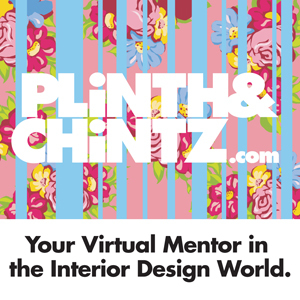 Our student chapter encourages fun, educational trips where all Rhodec students can meet to see and feel design. 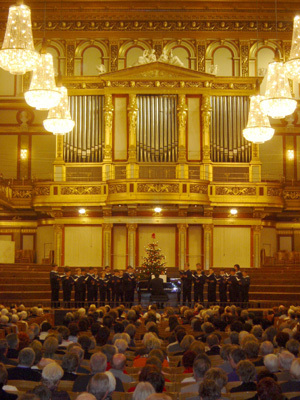 This time we met in the wonderful city of Vienna , Austria , from December 1-7, 2004 . For those of you who did not get the opportunity to join in on the fun, you can live vicariously through my writing and images. 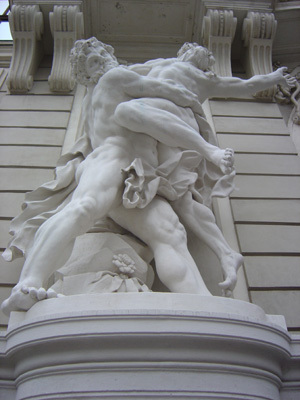 Most of the students arrived in Vienna throughout the day. As I reside in Vienna , Sheree, Chris, Fiona and Lorene came to my place for a welcome dinner. We were excited to finally meet one another. We talked about the challenges of distance studying, gave each other tips, and learned a bit more about our different lifestyles. We started our day at the Hofburg Palace, Baroque style center of the Habsburg Empire for over 600 years and also the main residence of the imperial family. At the Imperial Silver Collection Museum we admired the magnificent Habsburg collections of glass, silver and porcelain. We were surprised to see that some of the porcelain painted patterns (imported from England , France , and China ) looked quite modern and not from the early part of the 19th century. The palace also displayed table linens, and we spent quite some time trying to discover the secret of the imperial serviettes fold still used today for governmental functions. These look really elegant with the dinner rolls inserted inside. Despite our efforts, still only two people truly understand the secret of how this is done. The Hofburg Sisi Museum is where we discovered the unusual personality of Empress Elisabeth and the many different facets of her character. Trying to keep track of everyone’s relation to one another got quite confusing. The Habsburg family had ties all over Europe , including Napoleon and Marie Antoinette! Then off to the Rococo style Imperial Apartments, which contain 19 ceremonial state rooms and residential apartments of Emperor Franz Joseph and Empress Elisabeth. The delicate gilded plaster ornamentation, silk covered walls, magnificent crystal chandeliers, and wood inlay floors were so magnificent. (Not the type of rooms we’d want to clean though!) We also toured rooms that were being restored, which was really interesting on its own. We could have stayed there all day watching new gold leaf being applied onto the old plaster, all of which was done before the walls were repainted. It was at the The Hofburg Cafe where we had lunch and where our trip slogan "so many pastries, so little time" emerged. We crossed over the street for a guided tour of the Spanish Horse Riding School , founded in 1572, and its stables. The famous Baroque Winter Riding School – founded by Josef Emanuel Fisher Von Erlach – was built from 1729-35. A column-supported balcony surrounds the interior where up to 8,000 people gathered for carousels (a horse pulling a small cart), masked celebrations, equestrian tournaments and imperial balls. The stables is the only Renaissance building remaining in Vienna today. By that time we had had enough of museums. After seeing so much extravagance we decided to stroll the streets to do a bit of shopping for ourselves before dinner. We laughed to learn that Lorene shocked the snobby server at the Imperial Bakery, (still open today) by asking for bottled water! No wonder we had so many washroom stops! We laughed even harder when we learned that she and Fiona also had free pastry vouchers for this bakery from their hotel. Tourists! On our way to the Cafe Frauenhuber, a famous Viennese coffee house where we were to have dinner, we made an impromptu stop at the Staltner & Furlinger design shop. We were welcomed by the very friendly designer Bettina, who showed us wonderful fabrics, told us about her favorite designers and Vienna trends. We then joined the many Viennese people standing by the street stands for a warm punch and ended the day by having fabulous desserts at the Cafe Mozart. 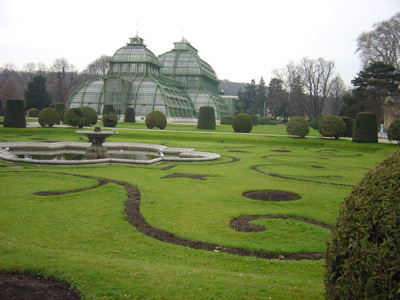 We met at the a garden entrance of the Schonbrunn Palace , the summer residence of the Imperial family and where famous artists and craftsmen from many different epochs created interiors of great beauty. We walked through the stunning gardens before starting our journey through the centuries, a journey which began behind a massive door at the top of the palace’s Blue Staircase. 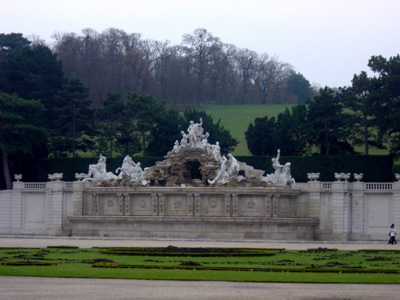 Although the palace exterior is Baroque, the interiors show magnificent early Rococo, 19th-century Rococo, and Neo-Rococo styles. The rooms have remarkable parquet flooring with intricate patterns. On the ceilings, we saw chandeliers now fitted with special light bulbs that imitate the effect of candlelight and animate the shimmering surfaces of the walls. Another striking detail was the remarkable marble paneling on certain doors. Our favorite rooms were the two Chinese Cabinets and the Great Gallery. The two Chinese Cabinets are impressive examples of Japanese and Chinese influences on decoration and furnishing in the18th century. Set into the white painted wooden paneling are lacquer panels of varying shapes and sizes. 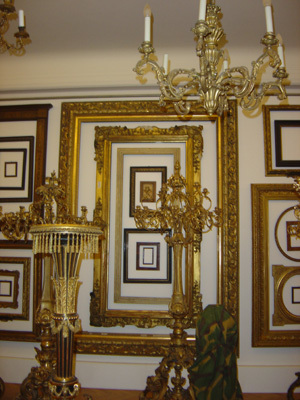 The gilt frames containing the panels incorporate little consoles which support pieces of blue and white porcelain. We really felt the power of great artistry and design, and some of us individually waltzed along the music in the great gallery / ball room, one of the most magnificent Rococo interiors in existence. Trivia: In 1961 the legendary encounter between the American president John F. Kennedy and the Russian head of state Nikita Khrushchev took place in this room. During our visit The Palace happened to be holding their annual Christmas Market, so we shopped for unique gifts, had lunch – and, of course, some more warm punch – before heading to the Musikverein for the Vienna ‘s Boys Choir Christmas Concert. On the way we stopped to admire the Art Nouveau Karlsplatz subway station. Please note that Christmas punch is not recommended before a classical concert unless you have someone to keep you awake by giving you the elbow now and then! 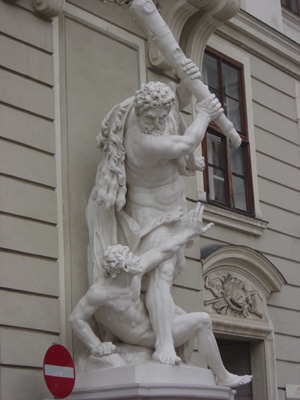 We made our way to the Albertinaplatz Museum and saw exhibitions of the Russian painter Marc Chagall (1887-1985) and the Flemish Baroque painter Peter Paul Rubens (1577-1640). Rubens was the most renowned northern European artist of his day, and he is now widely recognized as one of the foremost painters in Western art history. We then had dinner at a quaint restaurant – formerly a wine cellar – located in the building’s basement. Susi met us for the time at the Hofmobiliendepot to see the "Bauhaus – Furniture. A Legend Reviewed" exhibition. We enjoyed discussing pieces from designers such as Walter Gropius, Ferdinand Kramer, Ludwig Mies van der Rohe, Charles LeCorbusier, and Marcel Breuer. This place is the also the imperial furniture collection museum – a must see for any design student who come to Vienna . Reproduction of old fabrics against the original showed us how vibrant these once were, and what a difference! 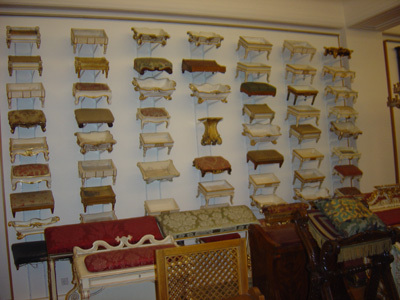 We were amazed to see the amount of furniture piled up in the storage area, but it allowed the pleasure of sitting on real Biedermeier chairs. The last museum room, full of sample displays such as woods, hardware, upholstery, faux painting, fringe, etc. was a real hit for everyone. We enjoyed the beautiful views of Vienna from the tree-filled terraces and relaxed in the winter garden before saying our goodbyes to Andreas, thanking him for all the insightful, fun stories and the extraordinary experience. An average of 8,000 people per day come just to see the exterior of the house. We then walked to the Kunsthaus where Hundertwasser had his atelier, now a museum over a gift shop and a restaurant converted to his philosophy. We sat in the restaurant to chat over a drink before visiting the museum with Hundertwasser’s painting and sculptures. Afterwards we dined downtown at the posh Barbaro Italian restaurant and then strolled the streets only to end up at the Mak coffee house for – you guessed it – desserts! 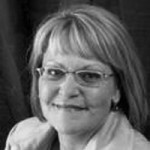 We had a wonderful day, but sadly had to say goodbye to Lorene who left early the next morning. We walked around the Rathaus (city hall) Christmas Market for a while and then rested a bit at the famous Viennese coffee house "Landtmann". We said goodbye to Fiona after lunch (who left to see the Secession before going back home), and headed to the superb Mak Museum. The permanent traditional collections and redesign of the gallery spaces by contemporary artists was the first experiment to be realized in the course of the Mak Museum ‘s search for a new identity. No architects were involved. The objective is to re-educate the eyes and perception towards the sensitivities and strengths of the individual materials. The permanent collection is composed of objects and artist biographies coming from a myriad of eras and locations: Romanesque, Gothic, Renaissance, Baroque, Rococo, Classicism, Empire Style, Biedermeier, Historicism, Art Nouveau, Art Deco, Wiener Werkstatte, 20th-21st Century Architecture, Contemporary Art, Orient, Far East. 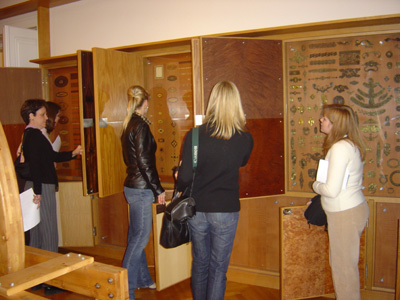 The Mak also has study collections where objects groups are presented in a simple uniform way to enable the visitor to view things by simply comparing them. The study collections are: Glass, Ceramics, Metal, Seating Furniture, Textiles. There are also the Work on Paper Room, Design Info Pool, The Frankfurt Kitchen, and Furniture in Focus, all of which are wonderful study tools! I will return for sure, there is no way to appreciate everything presented here in only one afternoon. Today is shopping day in Vienna ‘s old gasometers! Since the end of the 1990s, four teams of star architects have been working on converting these four 102-year-old gasometers into a new urban complex. This complex is composed of 615 modern apartments, an events hall holding 4,200 people, and a shopping mall with some 70 retailers. The gigantic size of this construction project is illustrated by the fact that Vienna ‘s Giant Ferris Wheel would easily fit into each of the four 75-meter high gasometers. Sheree, Chris and myself spent the afternoon there before meeting Susi for our last dinner in downtown Vienna . The remaining students made it back home. As you can see, this has been a fun but very busy week. I cannot stress enough the importance of such trips for design students. Actually seeing objects and feeling spaces made such an impact on us all – something you simply can’t get from a book or classroom discussions. I hope that this trip encourages you to get out there as much as you can! NOW GET OUT THERE AND TRAVEL!